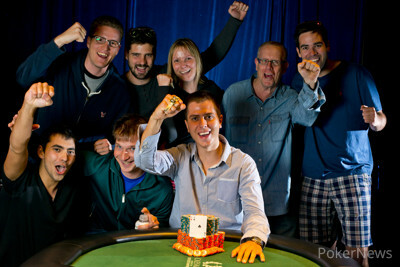 Norbert Szecsi claimed his first bracelet. Norbert Szecsi has conquered a starting field of 2,100 entrants to win Event #42 $1,000 No-Limit Hold'em, taking home $345,037 and the coveted World Series of Poker gold bracelet. Szecsi more than doubled his career live tournament cash tally of $137,207 with his win at one of the quickest final tables of the summer, which ended in just 132 hands and less than five hours. The Hungarian brought the third-biggest stack into Day 3, but he was the shortest stack with six players remaining. A run of good fortune vaulted him to the top of the counts, starting with this flip. Shortly thereafter, he got it all in with nines against aces and hit quads. His rush peaked when he called off on the turn against aces up and rivered a flush to eliminate Kirby Martin. Szecsi had half of the chips in play at that point, and he cruised into heads-up play with about a three-to-two lead. Heads-up play lasted a mere seven hands, and Szecsi's aggressive play and a lucky flop bounced Denis Gnidash in second. Two of the most accomplished players of the 11 who survived to Day 3 were ousted early: Dan Murariu in 11th and Daniel Neilson in 10th. After that, the final table proceeded quickly, with Rory Mathews, who started the day with the chip lead, busting in fifth and Chris DeMaci, who had the most accomplished WSOP resume of today's contenders, busting in third. Hand #130: Norbert Szecsi raised to 80,000, and Denis Gnidash folded. Hand #131: Gnidash raised to 80,000, and Szecsi three-bet to 220,000. Gnidash folded. Hand #132: Szecsi raised to 80,000. Gnidash made it 205,000. Szecsi made the call. The flopped, and Gnidash came out with 225,000. Szecsi called. A arrived on the turn, and Gnidash slowed down with a check. Szecsi fired 340,000. and Gnidash called. A hit the river, and Gnidash checked again. Szecsi put Gnidash all in. Szecsi's two pair was good, and he claimed the bracelet. Hand #126: Norbert Szecsi raised the button and Denis Gnidash folded. Hand #127: Denis Gnidash raised to 80,000 and Norbert Szecsi called to see a flop with both players checking. The turn of the saw Szecsi bet out 90,000 and he collected the pot. Hand #128: Norbert Szecsi raised the button and Denis Gnidash folded. Hand #129: Denis Gnidash raised to 80,000 and Norbert Szecsi called as the flop was checked by Szecsi before Gnidash bet out 75,000. Szecsi called as the landed on the turn. Szecsi checked, as did Gnidash before the completed the board on the river. Szecsi led out for 235,000 and Gnidash made the call before Szecsi tabled his to scoop the pot. Both Norbert Szecsi and Denis Gnidash asked for a dinner break 90 minutes early then scheduled, but at this stage the Tournament Director has asked them to play on until he finds out from a higher authority. Hand #120: Denis Gnidash got a walk. Hand #121: All three players saw the flop of , and it got checked to Norbert Szecsi on the button. He bet 90,000, and Chris DeMaci jammed. Szecsi folded. Hand #122: Gnidash raised to 80,000. Szecsi reraised to 230,000, and Gnidash folded. Hand #123: Szecsi raised to 100,000. Gnidash called. Szecsi checked, and Gnidash checked on the flop. A came on the turn, and two more checks ensued. An hit the river, and two more checks happened. Gnidash took the pot with . Hand #124: Gnidash completed the blind, and DeMaci checked. Gnidash check-called 45,000 on . Both players checked the , and a hit the river. Gnidash bet 75,000, and DeMaci folded. Hand #125: Gnidash folded, and DeMaci moved in. Szecsi called. 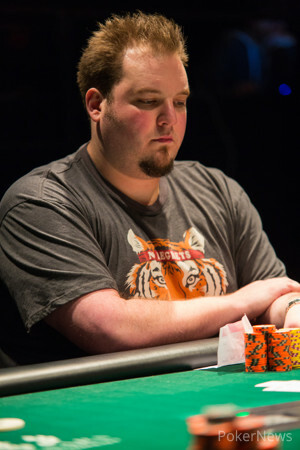 The kings held up, and DeMaci, the most accomplished player remaining, was done in third. 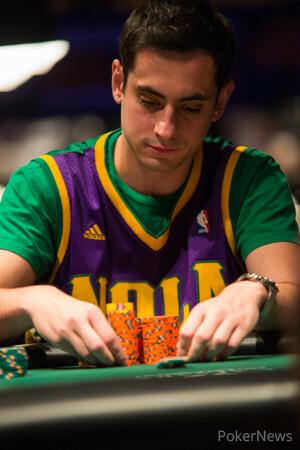 Hand #114: Denis Gnidash opened to 80,000 from the button and he won the blinds and antes. 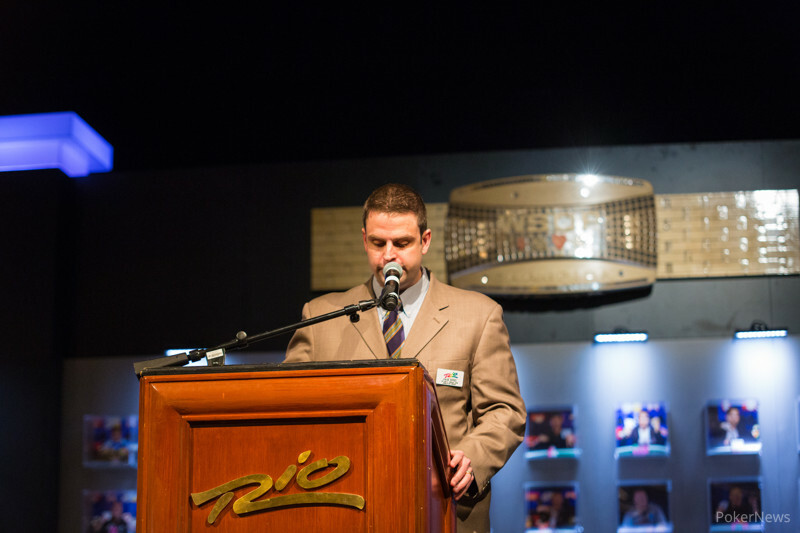 Hand #115: Norbert Szecsi opened to 80,000 and Denis Gnidash called to see a flop fall. Szecsi continued for 120,000 only to have Gnidash make it 285,000. Szecsi folded and Gnidash won the pot. Hand #116: Denis Gnidash limped the small blind and Chris DeMaci checked to see the flop fall before both players checked as the landed on the turn. Gnidash bet 55,000 and DeMaci folded. Hand #116: Norbert Szecsi received a walk in the big blind. Hand #117: Norbert Szecsi raised and Denis Gnidash called to see a and Szecsi bet out 110,000 to win the pot. Hand #118: Norbert Szecsi opened to 80,000 from the button with Chris DeMaci calling as the flop was spread by the dealer. Both players checked as the landed on the turn and both players checked again. The river landed the and DeMaci bet out 105,000 only to have Szecsi move all in. DeMaci went into the tank for close to a minute before folding. Hand #107: Chris DeMaci limped the small blind, and Norbert Szecsi checked. DeMaci check-folded the flop. Hand #108: Denis Gnidash got a walk. Hand #109: Szecsi raised to 80,000 and won the hand. Hand #110: Szecsi got a walk. Hand #109: DeMaci raised to 80,000. Szecsi was the only caller, and the flop came . Both players checked. A fell on the turn, and Szecsi decided to seize the lead with 95,000. DeMaci called him. The river was the , and Szecsi upped the stakes with 280,000. DeMaci bowed out. Hand #110: Szecsi's 80,000 on the button took the pot. Hand #111: Gnidash raised to 80,000 and took the pot. Hand #112: Gnidash checked a flop after calling a preflop raise from DeMaci, and DeMaci checked behind. A arrived on the turn, and Gnidash fired a bet, which DeMaci called. Gnidash's 215,000 river bet cause DeMaci to fold immediately. Hand #113: Gnidash called from the small blind, and DeMaci checked. Gnidash threw out a flop bet, and DeMaci folded.